The new Disney Concert Hall and the neighboring Cathedral invite so many comparisons as pieces of architecture or urban design that the time-honored device of contrast-and-compare is almost too obvious, too predictable, like shooting ducks in a barrel: categories of scale, form, materials, raison d’etre spring to mind. These are two fraternal twins birthed at the same time, though the Disney is a much older design. But much inquiry begins with the self-evident, and the self-evident only evolves into something more interesting if one looks down into the barrel when the smoke clears, to see just exactly what happened to the ducks. One of the myriad ways to compare the two underscores the difference between secular and hallowed ground, between worldly and sanctified space. That difference is important because each building defines and propels a specific role for a human in a particular community. Of course, any architecture, good or bad, accomplishes this, intentionally or not, but these two buildings conveniently provide two very sharp contexts for behavior. And because they provide these profiles so emphatically, so largely, they create opportunities to live differently in Los Angeles. We are invited to inhabit bigger identities. These two contexts can easily be rendered graphically: if one were to plot the traffic pattern of all the pedestrians around and in the Concert Hall on a summer’s evening, the lines will in certain areas be (apparently) chaotic, each line a decision by an individual, at least until the ten-minute gong bids our return. In contrast, the same exercise applied to the Cathedral will generate a very different figure-to-ground drawing, where one traffic pattern will be repeated over and over again as a heavy line. What import do those two contrasting graphics have in interpreting the nature of these two spaces? At the Concert Hall’s website, words like “open,” “accessible,” “inclusive,” and “dispersion” appear frequently (I am not referring to disabled-accessible requirements, which are a different order of inclusivity and these days quite default). The Hall site is permeable to the city. It promises trysts and random encounters. It celebrates chance. For example, at the Concert Hall there is more than one public entrance: the lobby’s sundry tasks will not only be dispersed along the street but will remain open during the day. Large operable glass panels will provide maximum visual accessibility to various amenities. Even the backstage door opens off a semi-public garden to encourage interaction between artists/musicians and the public (hmm … nice in theory at any rate) A 2,500-car garage on six levels will be constructed below the hall with access from three surrounding streets. The contrast with the Cathedral is striking. A recent visit was a revelation in how Catholic theology is interpreted in space and time here and now in Los Angeles. As I walked the site – walked the plan – what was striking was how sternly restricted, controlled, and how authoritarian (and therefore how predictable) the movement of the laity will be, beginning with both pedestrian and car access from Hill and Temple Streets. That control is theology made manifest. The Holy Catholic Church intends to provide a kind of a fortress/ sanctuary for its body of believers, who as Christians are instructed to set themselves apart from the world yet to be very much in the world. Many of us, after all, know that the nave, the main gathering place in a church, comes from the same Latin root, navis, things nautical and naval. A ship cuts through a sea of water, a foreign element that the ship was designed to perfectly inhabit with grace, fortitude and speed. The nave of a ship is where believers gather to worship and also to gain grace and fortitude (if not speed), to inhabit not a foreign element at all, but a debased world in which the believers themselves have had a hand in debasing. To suggest that the Cathedral campus be more urbanistically “inclusive” is to misread its very catholic (lower case c) theology – universal, perfect, applicable to all – and render it nicely. This is not the Crystal Cathedral, which of course is not a cathedral at all in the traditional sense of containing a bishop’s throne or being the city seat of the principal church of a diocese. Architect Jose Rafael Moneo and Cardinal Roger Mahony have a very clear idea of exactly what kind of journey people will have. First, they move away from the group of outbuildings at the eastern edge of the campus. Here Mahony and other priests and staff have a large apartment complex, reminiscent of rambling flats in Vienna or the Upper West Side; large multi-purpose rooms; a huge, complex commercial kitchen gleaming with miles of stainless steel. These outbuildings are mysterious because they appear to be quite intentionally banal, not only clearly stating their secondary status vis-?-vis the Cathedral with their corporate could-be-anywhere-anything appearance but also aligning themselves visually to neighboring buildings and creating another civic edge along the street. Like the immediate seismic moat around the Cathedral building, these buildings act as a larger moat for the entire complex. The outbuildings left behind, the parishioner moves out from the parking lot on Hill to the below-grade plaza and then west, through Robert Graham’s doors, past the chapels and into the back of the cathdral, but still outside the nave. There (a place) and then (a point in the journey) a huge opening to the north opens. Here one reverses direction 180 degrees to face east to Jerusalem. The gaze is pulled upward toward the cross bathed in light, the angled concete extrusion itself a masterstroke of perception and structure meshing indelibly. Reversing the orientation of the chapels to face the outside of the nave on the south decreases idle movement and noise in the nave and thus increases the opportunity to make the procession even more focused as one proceeds, inevitably, to the sanctuary. 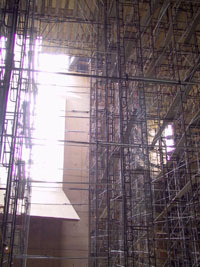 The change, somewhat like exposing part of the belly of the nave – a spatial move – conspires to temporally order the procession as each chapel invites repose. Every move in this journey has been calibrated to ensure a not a ramble but a procession, which is a walk of cadence, modulated intonation, ennobling the laity along with the clergy, who will have plenty enough pomp and circumstance of their own. This ambulatory graphic is traced over and over again until one day five hundred years from now the path will be as ripe for photography as the famous photograph of the steps in Wells Cathedral is today, rounded by centuries of rough cloth and bare knees. There are three words in the Cathedral’s performance specification that irrevocably changes everything about how its design is considered. Those words are “continuity of service.” That means that the building’s structural robustness is determined by calculations which factor in a “design earthquake.” It goes well beyond abiding “life and safety” criteria that afford time to escape a building but does not assure its structural viability. Instead, continuity of service seeks a degree of permanence unique to our City of Famously Ephemeral Angels and Mores. Neither concert halls nor churches are considered as vital as hospitals and fire stations and only need to meet life and safety regulations. Whether ego, fear, or altruistic concern is driving, both of these buildings are well “over”-engineered. Raphael Moneo’s church sets a new standard for Catholic cathedrals. Moneo renounces traditional Catholic treatments, such as stained glass and animated surfaces, in favor of a far more severe palette of materials and textures. Instead, there are large spaces, monolithic surfaces of golden concrete, deep punctures of carefully orchestrated light passing through the thinnest of alabaster panels. One cannot help but recall the medieval monastic orders who envisioned God both as light and as ultimate order and pure harmony. They conferred on architecture its mightiest role ever: as directly revealing God’s order and humankind’s place in it. It is said that the powerful Abbot Suger (1081-1151), political advisor and confidante of Louis VI and Louis VII, as well as the head of the powerful Clunaic abbey at St. Denis, read passages to his masons building the new St. Denis (1140 on). These passages were excerpts from emerging philosophies which spoke to this new understanding of God, such as, “Fire is insuperable and pure, not held back by any servile baseness … it suddenly enkindles and uncontrollably flies upwards.” Armed with the ilk of such words from Dionysus the Aeropagite (the Pseudo-Dionysus), the ardent Suger could now justify the use of stained glass and gold, because they captured and transformed light, and thereby apprehended God with new imagination. In rainy places, colored glass must have been extraordinary when sun at last did appear; here in Los Angeles we are not jealous of our light. Color in the Cathedral will come primarily from the clerical costumes; in effect, the stained glass figures have jumped the wall and are now moving among the congregation. The other brilliant color will come from the red marble altar whose stone was hand chosen by Cardinal Mahony, similar to Suger’s personal search for robust tie beams in St. Denis’s roof structure. 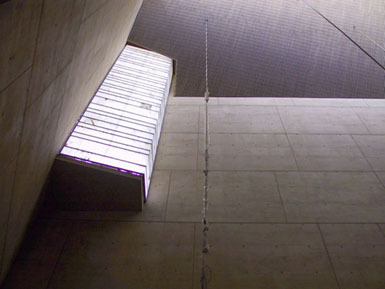 Suger also made sure that shafts of light would hit the altar at particular points, just as Moneo did for Mahony’s altar. Light is treated as a line linking altar and God, a very different sensibility about light in contrast to the enormously cheerful ambient light at the Crystal Cathedral. According to Wilhelm Worringer in Form in Gothic, Gothic architecture was achieved by negation of the stone (in contrast with Classical expression which affirmed the stone.) “The sight of a Gothic cathedral impresses us as an outburst of transcendental longing expressed in stone … an intoxication of an endless willing and craving,” Worringer wrote. With contemporary technology, Moneo’s work can simultaneously celebrate light’s sacredness without suppressing stone or seismic resiliency. Time will tell whether that Francophile Gothic intoxication with asymmetry, with distended cravings, has currency in the twenty-first century in Southern California.